Here's a quick and easy Triangle Box made with the new Holiday Treasures designer series paper and the Top Note Die (exclusive to SU - this will be available to customers to order in September). 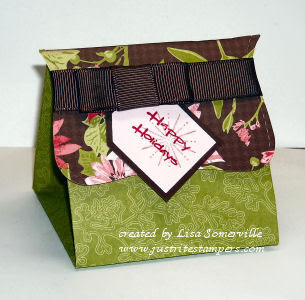 I created the box using a pattern that was done by Linda Hansen (shown at convention), to create the flap on the box, I used the Top Notch Die, I think it makes a wonderful looking flap. For the tag my I used my Just Rite Pre-Inked Holiday Stampers, and overstamped a snowflake from Snow Burst, then punched out the tag using both the large and small tag punches. I was excited to see that the project I created the other day was nominated for the Stampin' Champion Hopefuls at Just Rite! This is a fab "box"! The monogram set the other day was totally adorable and I am glad that has been recognized. I just love this box! You did an awesome job on it!